Review posted June 8, 2018. Sheryl Sandberg's husband Dave died suddenly after they had been married only eleven years. 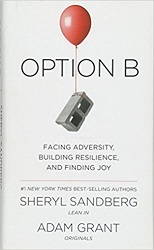 This book is framed as the story of her loss and the hard road of recovery, but she's extended the application to a look at how to build resilience in the face of adversity. Yet try as we might to prevent adversity, inequality, and trauma, they still exist and we are still left to cope with them. To fight for change tomorrow we need to build resilience today. Psychologists have studied how to recover and rebound from a wide range of adversity -- from loss, rejection, and divorce to injury and illness, from professional failure to personal disappointment. Along with reviewing the research, Adam and I sought out individuals and groups who have overcome ordinary and extraordinary difficulties. Their stories changed the way we think about resilience. We plant the seeds of resilience in the ways we process negative events. After spending decades studying how people deal with setbacks, psychologist Martin Seligman found that three P's can stunt recovery: (1) personalization -- the belief that we are at fault; (2) pervasiveness -- the belief that an event will affect all areas of our life; and (3) permanence -- the belief that the aftershocks of the event will last forever. The three P's play like the flip side of the pop song "Everything Is Awesome" -- "everything is awful. " The loop in your head repeats, "It's my fault this is awful. My whole life is awful. And it's always going to be awful." This book is best and most powerful in all the personal moments she shares about her own struggles after her husband's death. Bringing in psychological research and other stories of loss does reinforce those lessons, but they almost feel canned in comparison. Don't shoot me, but I've long thought that in many ways divorce is worse than the death of a spouse. Reading this book reminded me that in many ways the death of a spouse is worse than divorce. Both are terrible, and in dealing with both you need resilience. But I'm not sure I would have liked reading this book when my divorce was fresh. Because she got to keep her good memories of her spouse, and they weren't tainted by wondering when he stopped loving her. As she grew and healed to where she was ready to try to love again, she didn't have to figure out how to stop loving her spouse, who was not the loving husband she thought he was. Her world was shaken -- but in just similar enough ways, I think I would have envied her if I'd read this ten years ago. And been mad at her for not realizing how lucky she was but also been ashamed of myself for not realizing how horribly unlucky she was -- in short, I think it might have added to my mess of emotions for being so close but so far from what I was going through. However, ten years down the road, after reading this book, I'm almost ashamed to even compare my journey with hers. I think perhaps because I did work at falling out of love with my ex-husband and I truly don't want him back any more, the grief doesn't last as long. But the lessons of resilience that she points out will help you through whatever Option B you have to settle for. I now know that it's possible not just to bounce back but to grow. Would I trade this growth to have Dave back? Of course. No one would ever choose to grow this way. But it happens -- and we do. As Allen Rucker wrote about his paralysis, "I won't make your skin crawl by saying it's a 'blessing in disguise.' It's not a blessing and there's no disguise. But there are things to be gained and things to be lost, and on certain days, I'm not sure that the gains are not as great as, or even greater than, the inevitable losses."